Oklahoma Plans To Use Nitrogen For Executions : The Two-Way After having trouble obtaining drugs needed for lethal injections, state officials plan to change the primary method of execution to nitrogen gas inhalation. It would be a first for a U.S. state. The gurney in the the execution chamber at the Oklahoma State Penitentiary in McAlester, Okla.
After having trouble obtaining drugs needed for lethal injections, Oklahoma is planning to change its primary method of execution to nitrogen gas inhalation. 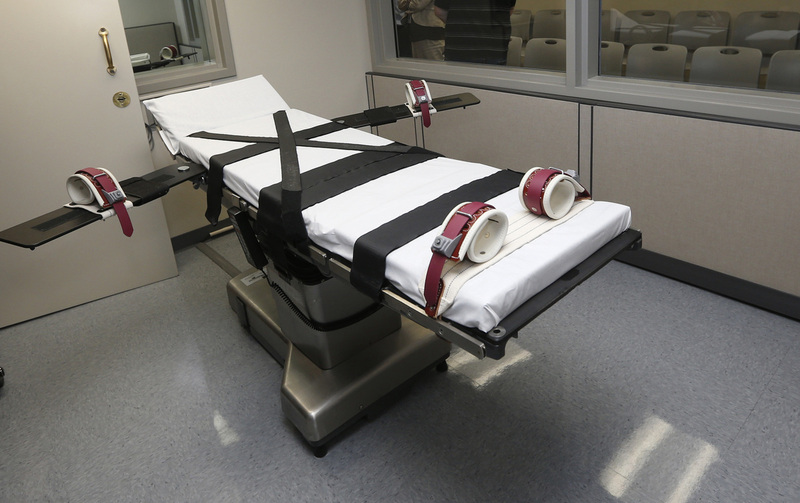 It would be the first time a U.S. state uses this method of execution, though six states have gas inhalation in their laws as a secondary method to lethal injection, according to the Death Penalty Information Center. "We can no longer sit on the sidelines and wait to find drugs," Oklahoma Attorney General Mike Hunter told reporters. Using inert gas inhalation "will be effective, simple to administer, easy to obtain, and requires no complex medical procedures." The state has not carried out an execution since 2015 following multiple problems with lethal injections. According to The Associated Press, that included "a botched lethal injection where an inmate was seen writhing in pain and another inmate who was executed using a drug not approved by the state." Like many other states, Oklahoma has recently had difficulty obtaining the drugs used in lethal injection cocktails. Manufacturers have objected to having their drugs used in executions. Department of Corrections Director Joe Allbaugh described what he called a "mad hunt" for these drugs. "I got to the point in finding these drugs that I was calling all around the world, to the back streets of the Indian sub-continent to procure drugs...The victims of death row inmates have waited long enough for justice," Allbaugh added. "Trying to find alternative compounds or someone with prescribing authority willing to provide us with the drugs is becoming exceedingly difficult, and we will not attempt to obtain the drugs illegally." Allbaugh stated that there are 16 individuals on death row in Oklahoma who have exhausted the appeals process. The two departments are working together to develop and finalize a protocol involving nitrogen, a gas that makes up more than 70 percent of what humans breathe. However, breathing nitrogen without oxygen is fatal. As Hunter explained, the gas causes "fatigue, dizziness, perhaps a headache, loss of breath, and eventual loss of consciousness." This could lead to death "in just a few minutes," Hunter added, citing unspecified "other studies." He also stated that the gas has been used increasingly in assisted suicides. The untested nature of the gas in executions is raising concerns from death penalty critics, and is likely to provoke legal challenges. "This method has never been used before and is experimental," Dale Baich, an assistant federal public defender and one of the attorneys representing death row inmates in a federal lawsuit, told The Oklahoman. "How can we trust Oklahoma to get this right when the state's recent history reveals a culture of carelessness and mistakes in executions?" Nationwide support for the death penalty is at its lowest point in more than four decades, according to the latest Pew poll conducted in 2016. Forty-nine percent supported the death penalty and forty-two percent opposed. But Oklahoma still broadly supports capital punishment, as The Oklahoman pointed out: "In 2016, more than 66 percent of the voters in the general election approved a constitutional amendment specifically stating the death penalty is not cruel and unusual punishment." Two other executions are scheduled to take place today in the United States, according to the Death Penalty Information Center. As Reuters reports, Georgia is planning to execute Carlton Gary for a series of murders where the victims were choked using pantyhose, and Alabama is set to execute Michael Eggers for a kidnapping-murder. The wire service adds that "lawyers for both men have launched last-minute appeals."